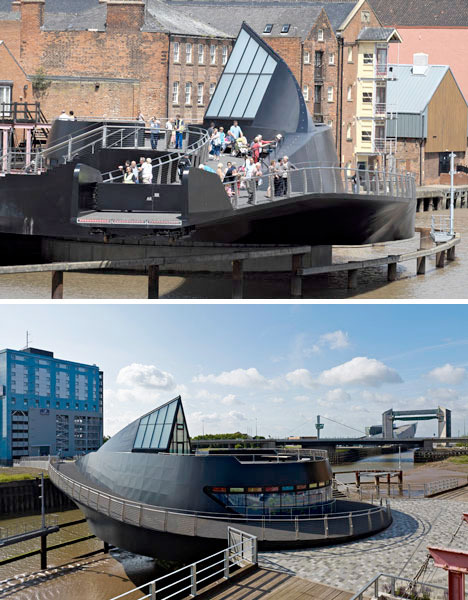 Shaped like an apostrophe and bearing a shark-inspired fin, the Scale Lane Bridge in Hull, England allows pedestrians to go along for the ride when it swings open to allow ships passage. 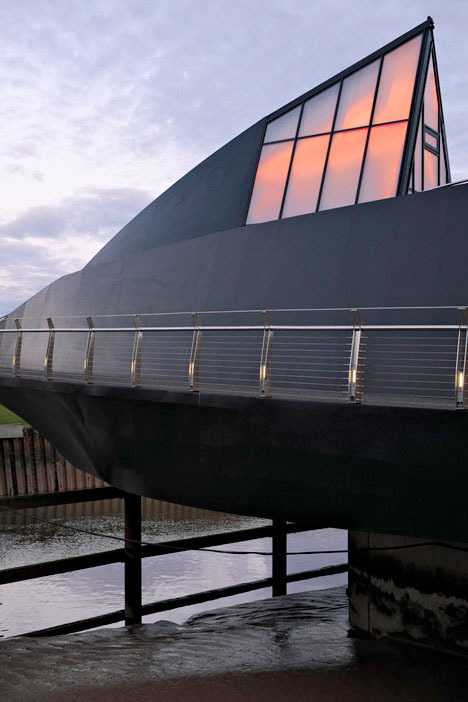 Made of black steel in a curving form, it resembles a ship when tucked up against the riverbank and viewed from afar. 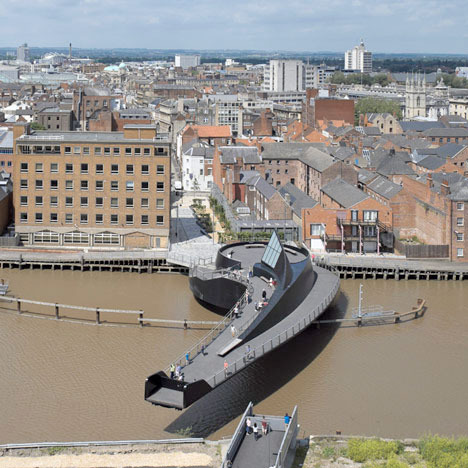 The Scale Lane Bridge is believed to be the world’s first functioning bridge that enables pedestrians to stay on it while it opens and closes. 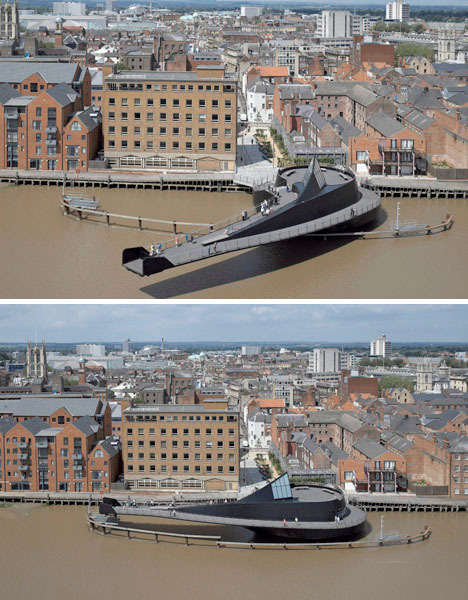 Spanning the River Hull, the bridge cantilevers 35 meters (about 115 feet) to the east from its perch on the west bank. 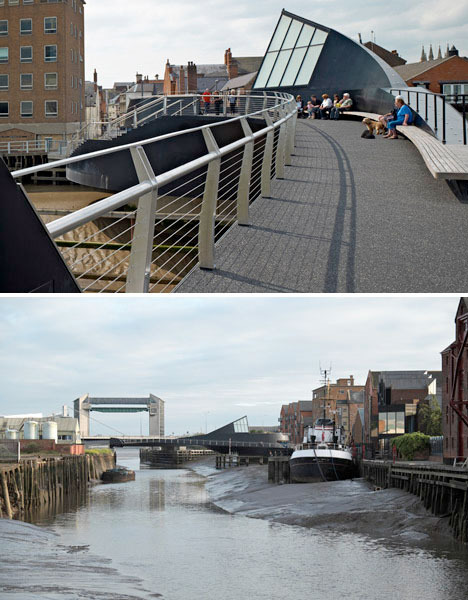 The bridge provides a walkable route from a new public square and the Museums Quarter on the west bank to ‘The Deep,’ an aquarium that’s one of East Yorkshire’s biggest attractions. The spine of the bridge allows enough room for smaller boats to pass beneath it. A viewing deck and seamless steel balustrade makes pedestrians feel like they’re on board a docked ocean liner, and offers a variety of seating areas. When the bridge opens, it activates a sequence of rhythmic bells combined with pulsing light to alert pedestrians to the imminent rotation and make the ride more exciting.